Buy through MusicWeb £14.30/15.10/15.60 postage paid. Louis Marchand left only two suites for harpsichord. Although these have been recorded several times they remain outside the standard harpsichordist repertoire. At first it seems Mario Martinoli offers a brand-new recording of those suites, but that is not the case. The cover says: 'Livre de pièces de clavecin, 1754'. Those who know Louis Marchand died in 1732 immediately realise something unusual is offered here. And the booklet reveals that this disc brings some pieces hitherto unknown, not just by Marchand, but also by other French composers of the 18th century. The fact that Marchand's name appears infrequently on concert programmes is perhaps due to the character of his compositions. Philippe Beaussant, in the programme notes to Blandine Verlet's recording of the two harpsichord suites, states: "Though his compositions are skilfully written, their mastery is not obviously admirable as such. They need to be studied closely before they are found to be very great music". And there isn't much music to choose from. Apart from the two suites, published by Ballard in 1702, only one further harpsichord piece was published, 'La Vénitienne', in a collection, also printed by Ballard in 1707. A large part of his fame was based on his activities as an organist. And again, only a handful of organ works were published, although posthumously, whereas a number of other pieces have survived in manuscript. It was his reputation as organist which led to the famous contest with Bach in Dresden in 1717, which he evaded after having heard Bach play. But that story is perhaps more fiction than reality. Marchand was abroad at the time, as he had left France in 1713, but not necessarily for musical reasons. It is quite possible that it was his private life which made him leave France for a while. By all accounts Marchand was a rather difficult character. To quote Philippe Beaussant: "Restless, cumbersome, self-conceived, slightly paranoiac, ambitious to the point of awkwardness, ready to trample underfoot all the musicians in the Kingdom to achieve his aims, and using means such that even the most tolerant became indignant, a bad husband, a bad father and a bad man …". In 1701 he and his wife divorced, and since then she continuously sued him for financial support. It is suggested he left France to get away from all his troubles. Beaussant also suggests that he perhaps felt Bach, being not more than a musician from the province, wasn't a worthy opponent. In addition, his reputation as an organist was such that it is hardly likely that he feared Bach's competition. 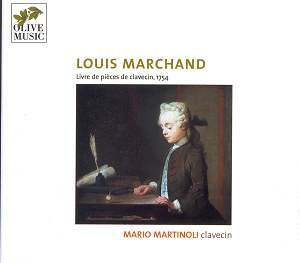 According to historical sources Marchand continued to compose and to play after the publication of his suites. It is anybody's guess why no other works were printed. From this perspective the disc is especially interesting. The works on the present CD belong to a mid-18th century manuscript book discovered in 2003 in a French private collection. It contains copies of pieces from well-known music collections of the early 18th century. But it includes also 19 pieces hitherto unknown, which in the manuscript are split into two different collections: the 'Livre de Suittes pour le clavecin composé par Monsieur de Charman(t) cordelier, et arrangé par Renard, à Paris, 1754', and 'Recueil des Airs différentes pour le clavessin composées par plusieurs auteurs, collectées par P. Renard, avec les parties en concert, et la basse, à Paris'. The date of the latter collection is unreadable. The first collection in the manuscript consists of a single suite of 14 pieces, two of which are in C major and 14 in c minor. The attributions given in the tracklist show there is much uncertainty as to who exactly wrote which piece. The attribution of a number of pieces to Marchand comes from the interpretation of the title, mentioning the name of 'Monsieur Charman(t)'. As no composer of that name is known, it is interpreted as an anagram of the name Marchan(d). But that name was very common in Parisian musical life: at least ten musicians with the name Marchand from three different musical families were active in Paris in the early 18th century. The addition 'cordelier' gives a further clue of the identity of the composer: Louis Marchand was organist of the Église des Cordeliers from 1707 until his death. The collection was put together and some of the pieces were transcribed by a certain Renard, whose identity has not as yet been established. The second part of the manuscript contains 23 pieces by various French composers, among them Couperin, Rameau, Marchand and Forqueray. Such collections were quite common at the time and were used as teaching material or as a book to play from. The person who put this collection together must have been an accomplished player, as most of these compositions are pretty virtuosic. Some pieces seem to be transcriptions of compositions for two treble instruments and basso continuo. Most interesting is the fact that five compositions are not known from other sources, which makes them important additions to the repertoire of French harpsichord music. All compositions are listed in a table in the booklet, with the relevant information concerning the possible composer and the character of the works. Mario Martinoli is an Italian keyboard player I hadn't heard of before. He has worked as a producer for a number of European record companies and owns a marketing and communications company. It seems that he is a part-time keyboard player, but definitely a very skilled one, as he delivers excellent interpretations. The sarabande Les Soupirs (track 5) is a very good example of his art, in particular his subtle use of rubato and the sensible application of 'inégalité'. In terms of repertoire and performance this disc rises above the average and I strongly recommend it to anyone who loves the harpsichord.